Material: Durable Cotton Yard.Vintage, Retro and Timeless Style. The strap is made of nylon and the hook and plate made of metal for durability. 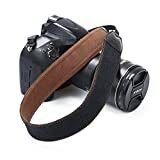 The adjustable length makes the camera strap applicable to most people. Item Dimensions: 1.5 x 1.5 x 26.77 inches; Item Weight: 0.4 ounces. Universal Strap Fits for All Brands of DSLR Camera,the universal interfaces are compatible with cameras of various brands. Package Included: 1 x Camera Strap. Compatible with CANON EOS Rebel T6i T6s T5i T4i T3i T3 T2i T1i XT XTi XSi SL1 and NIKON D7100 D7000 D5200 D5100 D5000 D3300 D3200 D3100 D3000 D90 D80 Canon EOS T5 EF-S, T6, T5i, T6i, 1D X, 5D Mark III , EOS 6D, 70D, / Nikon D5500, D500, D3200, D3300, D7000, D750, D7200, D7100, D5300, D810 FX-Format / Sony a6000 Alpha, a5100, a7R II Full Frame, a7II, a7S, a3000, a5000 / Fujifilm X100T, X-Pro2 / Panasonic Lumix DMC-GH4, / Olympus OM-D-M10, PEN E-PL6c and etc. Our company pays great attentions to the shopping experiences and feedback from the customers. Your satisfaction and positive feedback with 6 stars is the motivation for us to move forward.It would be highly appreciated if you could leave a good review or a positive feedback to our product and our store. This entry was posted in Discount Photography and tagged Camera, Cameraclassic10, Canon, DSLR, Fuji, Multicolor, Neck, Nikon, Olympus, Panasonic, Pentax, Retro, Safety, Soft, Sony, Strap, Tether, Vintage, Wrist by Ball Photo. Bookmark the permalink.